We’re always looking for ways to increase our garden production and this year we expanded UP and tried out VERTICAL gardening. 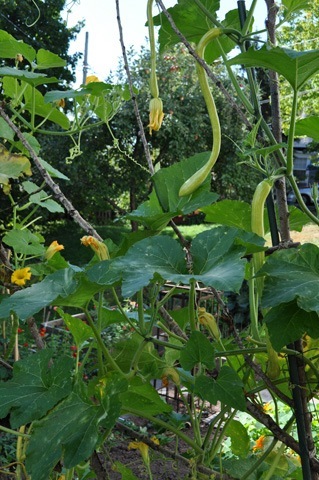 It’s been fun to watch pumpkins and zucchini growing up trellises. Last Spring, Skoogie helped Pete make one of the trellises using trimmed tree branches and then planted heirloom summer squash seeds called “Zucchetta Trombolina,” with origins from Italy. It was the first time she REALLY ate zucchini and enjoyed it. “It is yummy on the grill.” Just another example, of garden magic!!! Now that we are harvesting 3 foot long zucchini, I’m trying to find ways to use them. The Muffins I featured in "A Few More Little Bites" post are a big hit, so I am FREEZING extra shredded zucchini for tasty, easy winter treats! What are you storing away in your freezer for the long winter months?